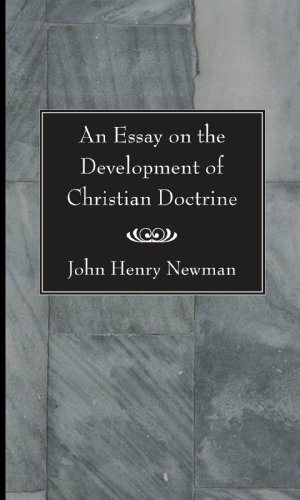 Amazon.com description: Product Description: John Henry Cardinal Newman begins the 'Essay' with a definition of development, pointing out that the real problem is how to distinguish true developments from corruptions and decays. He then goes on to a sweeping consideration of the growth and development of doctrine in the Catholic Church, from the time of the Apostles to Newman's own era. He demonstrates that the basic ""rule"" under which Christianity proceeded through the centuries is to be found in the principle of development, and emphasized that throughout the entire life of the Church this law of development has been in effect and safeguards the faith from any real corruption. About: The following pages were not in the first instance written to prove the divinity of the Catholic Religion, though ultimately they furnish a positive argument in its behalf, but to explain certain difficulties in its history, felt before now by the author himself, and commonly insisted on by Protestants in controversy, as serving to blunt the force of its primâ facie and general claims on our recognition.